(Anna) I'm ready for my kid's race. Daddy tells me to do a warm-up run so I jogged around the picnic area. They said it was time to line up. Ariel is racing, too. We line up together. We are waiting for other kids to come. 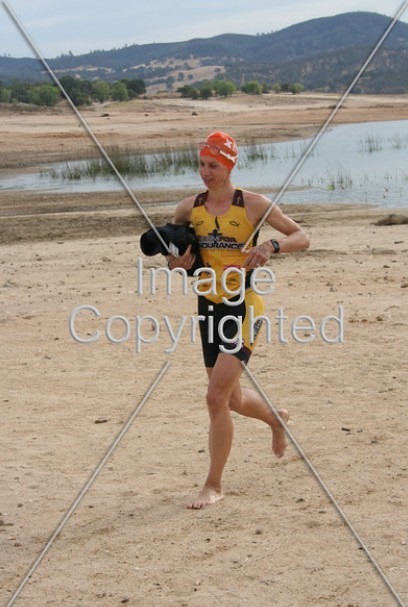 They're walking up from the water where their parents had started the triathlon. We raised our hands as the director called each one of us. There's a guy on a bike doing wheelies. He's going to lead us. Another will be behind us, probably with Ariel. Go! I run along the trail. This time we didn't go through the sand. We went up, across, and along the parking lot towards the finish line. I ran strong to the finish. 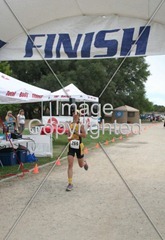 I finished 4th, but was the 3rd girl. Then I cheered for Ariel, my little sister, coming in. After Ariel finished we hugged and then went to get food. (Ariel) I tell Daddy I want to run alone. Go. I start running really fast. After a while my stomach is hurting. But I don't tell Daddy. Even though my tummy hurts, I'm still having fun. I like the course. I think I'm going to make it. Soon my tummy feels better. I'm able to run faster. I see the finish line and I think I'm going to win. I cross the finish line and Anna is waiting for me. We hug. That was fun! I meet up with friend/FCA teammate, Karen Nickel, at Indian Hill to ride down to Granite Beach. It’s a great downhill ride and a good way to warm-up. We get to the race start and check in. Francie Campbell and son-in-law Steven help us get this done. After a warm-up run, I see Troy and the girls arrive. Yeah! Karen’s hubby, Jeremy, and kiddos Ben and Ellie arrive too. Anna and Ariel are doing the kids trail run. They start just before I do. I am sad not to be able to see them run. At least when I come out of the water, they’ll be done so I can see their cute faces. We pray with Karen for our races…we hope to be a light and a help to others out there! I then say goodbye to the family and start the 1/3 mile walk down to the start. I’m excited to swim today! I’d love to be with the top gals if possible coming out of the water. I remember dreaming of that possibility over the years and it’s becoming more of a reality. I have to thank the Lord and coaches at Rocklin Aquatic Masters. I’m not training harder but my form has improved a lot. I get in the water and warm-up. It feels good! Let’s go! I tell an old acquaintance, Tina Watts, to have a good day out there. Ready, set, go! The group gets a fast start and I find myself right behind a group of five. I’m swimming off to the right on my own so I veer to the left to get in with those gals. There’s no use being alone! After a few minutes, I find myself moving up to the front. Soon I’m right next to the top girl and passing her. Wow, thanks Jesus! I put my head down and rely on my straight swimming to get ahead and avoid being a draft for someone else. I notice I’m drifting today to the right a bit. I make sure I look up to keep myself on track. After turning at the first buoy, it looks like I have a good gap. I focus on pulling the water and keeping my head down as I swim to the next buoy. I am amazed at how strong I feel. I round that last buoy and go for it. I pull hard until my hand scrapes the bottom. 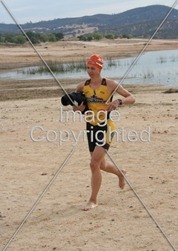 I jump up, run a bit to the shore, get my tag pulled and then rip off my wetsuit. It comes off nicely and I’m on my way with a 0.3 mi run to T1. With the adrenaline flowing, the rocky beach doesn’t seem too bad. I look up and see yellow from a far and know it’s my family waiting for me. Yeah! I finally get up to them and give the girls high 5’s. “How did your races go girls?” Good they say and Troy mentions that Anna was the 3rd girl…awesome! I get to my bike and make a decent transition. As I ride out, I see Dave Campbell directing the riders. He cheers me on as I head out on this 2 loop course (6 miles x 2). About a 3/4 of a mile into the ride I hit newly paved roads. Wow! This is so nice and smooth! I finish the first loop at over 20mph. Thanks Jesus! I get to see Karen finishing her lap and tell her to have a good run. Then I see Dave, Troy and the girls. I wave to them and say hi. Now I need to keep up this effort for the next loop! It seems to be going well. As I approach the back half, I see a guy walking his bike the other direction. “Do you need anything?”, I ask. I can’t hear his response as I roll by and I feel bad for not stopping. I decide to finish this loop and then look for him on my way back. I’m still over 20mph pace. Yes! On the way back I see Tina again. She continues to look strong. I finally see the guy walking and find out that he needs a pump and is walking to someone who has one. He’s heading the same direction to a short little out and back section. Another girl is stopped. I find out that she’s struggling to fix a flat. I don’t see a pump or someone to help. On my way back, I see the guy with the gal. I ask how I can help and offer my inflator but his stem is too short for it…bummer! I tell them I’m sorry I cannot do more. He seems to be helping her so I leave. At least they can help each other…I hope! I head back and I notice my pace has dropped off some but I’m still a tad over 20. It was worth it stopping…I never want racing to be all about me. 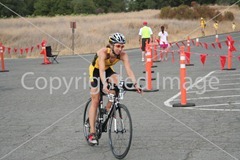 I make it back to T2 and pass by Dave who cheers me on. Troy and the girls are waiting and cheering too. I make it out on the run in a pretty good time…yeah! I follow an older guy out of transition who is fast! He gets some distance on me and I just keep him in my sights. Mile 1 is 7:33. I’ll take that! Eventually I catch up to him once we hit the hills. I tell him good job. He definitely helped me get into gear! 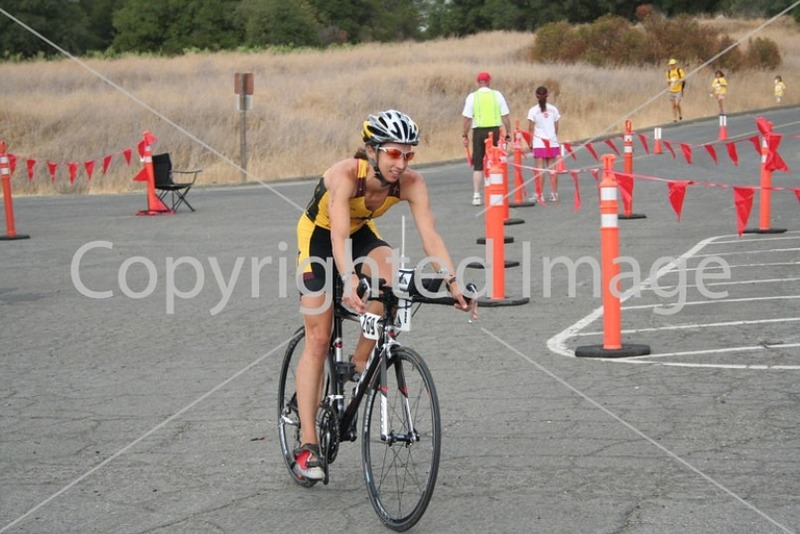 I can sense that there must be some fast women coming up behind me. It’s nice pressure to have! Mile 3 is 7:18. That big hill is coming! I run up the hill with a good effort…man this hurts! Once I get to the top, I’m relieved! I just let gravity bring me down. Mile 4 is 7:55. It’s mostly flat to the end so I dig in. That girl could be really close now! I try to catch the guys in front of me and use them to keep my head in the game. As I round one corner, I see a guy getting up from the ground and he’s got dirt all over his back. Wow, way to get back up and keep running! I try to catch him but he just takes off! I wonder if I’ll see Troy and the girls before they head off to church. It’s 10:45am and church has already begun. As I hit the home stretch, I see him waiting for me. Yeah! I push hard and finish strong. I immediately go to Troy and give him a hug before he has to leave. I love him for all he does and all the support he gives! 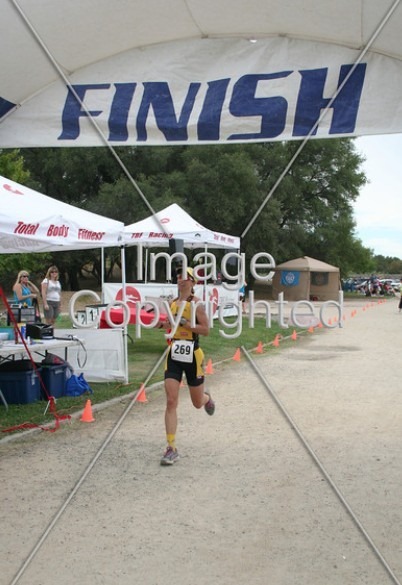 Again, thank you Lord for him, my girls and another fun race!